Christmas means different things to different people - personally I'm celebrating the return of daylight - but apart from the deeper meaning, it does seem to consist largely of traditions. Sometimes the value of tradition outweighs all other considerations - I don't care if none of us like sprouts, it's Christmas! Mostly, I'm not a fan of tradition (no sprouts in this house), but there is one Christmas tradition that I keep, and it would upset me not to do it. Even if I don't send a single card or don't put up one strand of tinsel, I will make Christmas sweets. My mum started this tradition. Every year for as long as I can remember, the weeks before Christmas were filled with melting chocolate, marzipan and icing sugar. Tasks were carefully selected so that little girls could join in (rolling marzipan to stuff dates, not cutting dates with a sharp knife) and as my sister and I got older, we shared the sweet-making as equals. Then, after Mum died, we carried on the tradition, through our teens and as we grew up, left home, and started families of our own (my sister taking on this latter task more wholeheartedly than I). I wasn't sure whether to write about Christmas sweets here - perhaps it would be nice to keep them our, Secret family recipe. I talked to my sister about this and she pointed out that most of the sweets are made to well-known recipes. The only ones that are unique to our family (as far as we know) are the peppermint mice. Even those are made from a standard recipe; it's the construction that might be considered a secret and that probably has more to do with our years of practice than any secret tips I could share online. We agreed that I could share our family tradition, with just a few hints about how to make mice. If that's enough for you to make them too, good for you! 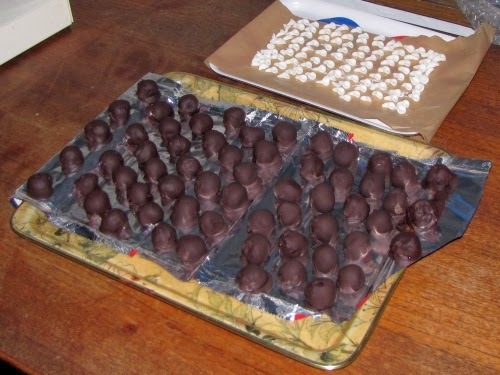 Mum varied the repertoire a bit from year to year, but four types were constant: Chocolate truffles, brandy cherries, stuffed dates, and peppermint mice. Since I'm married to someone who doesn't like dried fruit, alcohol, or peppermint ( It tastes like toothpaste - it's just wrong! ), I've added chocolate caramels (for which I am indebted to Susie for inspiration - see link for how to make these). The standard recipe for chocolate truffles consists of heating cream gently and melting dark chocolate into it, then (optionally) beating a little alcohol into the mixture after it's cooled. 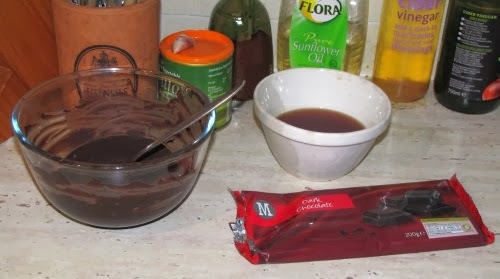 Ratios of chocolate:cream vary from 2:1 to 1:1, so it's not terribly critical. 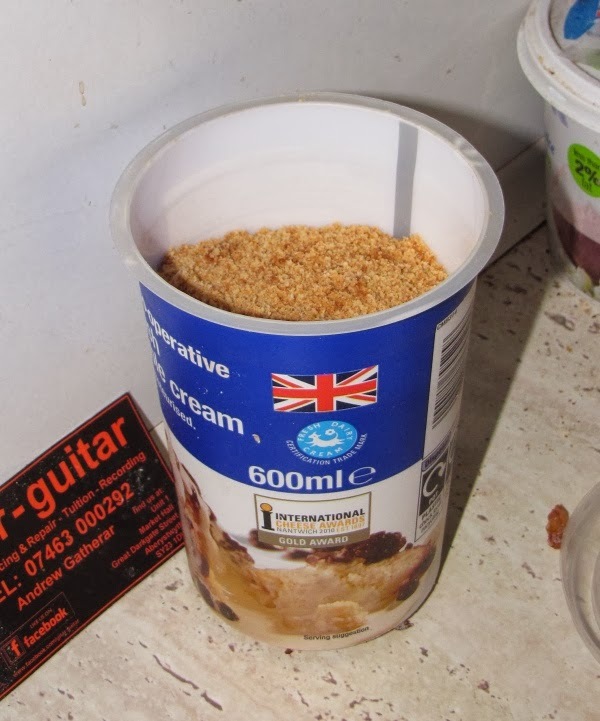 Mum always padded the mixture out with crumbled stale sponge cake. Stale cake? I hear you ask. Well, no, not in this house either. I make a very plain cake specially, just for the crumbs. Not only does it make more truffles, but I prefer the firmer texture, too. Buy glace cherries, soak in brandy, drain (keep the boozy syrup! ), coat in dark chocolate. Simple. Buy dates, remove stones, replace with marzipan, roll in sugar. Also pretty simple. Mum used to add food colouring to some of the marzipan, so we had a selection of colours. I don't find food colouring so appealing these days, though I do still buy yellow marzipan as opposed to white , which I presume is uncoloured. Mix egg white and icing sugar and a little peppermint essence (I have an ancient bottle of pure peppermint oil, so very little is required) to make peppermint cream mixture. Add a little glycerin, which stops it setting hard, then add more icing sugar. More than that. No... more still. You're aiming for the consistency of modelling clay. When you think you've added enough sugar, add a little more. In the unlikely even that you've added too much and the mixture cracks when you mould it, a drop more glycerin will solve the problem. ... and what else is that in the second picture? Oh, yes. Mouse ears. You have to make the ears first and leave them to dry for a few days before making the rest of the mice. Do not be tempted to put them in a warm place to speed this process, as they tend to go yellow. I still haven't figured out a way of stopping the colour running on the mouse faces.